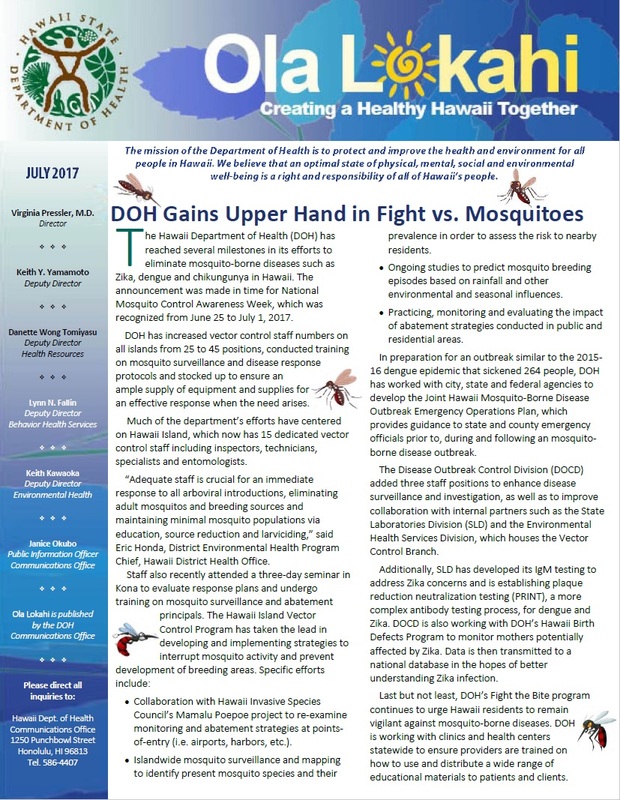 The Hawaii Department of Health (DOH) has reached several milestones in its efforts to eliminate mosquito-borne diseases such as Zika, dengue and chikungunya in Hawaii. Open the attached newsletter pdf to read more. The Association of Public Health Laboratories (APHL) recently presented its 2017 Presidential Award to Rebecca Sciulli, Laboratory Preparedness and Response Program Manager for the State Laboratories Division (SLD). Open the attached newsletter pdf to read more. A new program in the Child and Adolescent Mental Health Division (CAMHD) is helping to turn around the lives of Hawaii’s youth for the better. Open the attached newsletter pdf to read more. The voyaging canoe Hokule’a made a brief stopover in Kalaupapa, Molokai, where she and the crew were greeted by the Hawaii Department of Health, National Parks Services, and a small group of supporters. DOH administers the remote Kalaupapa settlement where patients with Hansen’s Disease were once sent. Open the attached newsletter pdf to read more. The DOH Drinking Water State Revolving Fund (DWSRF) Program exceeded funding requirements by disbursing more than $50.3 million of loan funds in State Fiscal Year 2017 to support infrastructure improvements in public water systems across Hawaii. Open the attached newsletter pdf to read more.